On the north side of Beltline Road, 200 yards west of the Dallas North Tollway. At BJ's Restaurant & Brewhouse in Dallas, Texas we strive to do three things better than anybody else: make great food, amazing craft beer and provide a second-to-none dining experience. If you're looking for a good time with friends, while enjoying one of BJ's Signature Deep Dish Pizzas and a round or two of our handcrafted beers, you won't be disappointed. The same can be said if you're looking for a spot to take the family, at BJ's we have a little something for everyone! View our menu for our Addison location. With over 120 options you are sure to find something on our menu that will delight. If you're watching your calorie intake then take a look at our EnLIGHTened entrées, you will find Moroccan Spiced Salmon, our new Lemon Thyme Chicken, a boldly spiced Barbeque Bison Burger and so much more. If you're in the mood for pasta we have a few different options to choose from. Steak? We have those as well, from BJ's Classic Rib-eye to our House Top Sirloin we have just the right cut, grilled just the way you want. If you're into handcrafted beer then you are in for a treat! 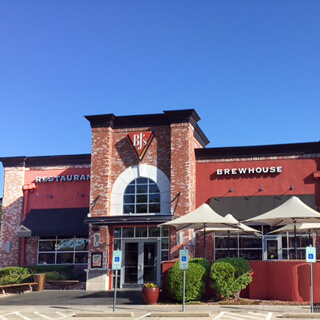 At BJ's Restaurant & Brewhouse, right here in Dallas, Texas, we have a vast variety of beers for even the most discerning palate - from the delicate balance of German Kolsch to the robust intensity of Russian Imperial Stout. Want something a bit hoppier? Try our HopStorm IPA. If you're looking to pair something a bit milder, at just 103 calories per 12-oz serving, try our LightSwitch Lager. Come, experience BJ's Restaurant & Brewhouse in Addison. Our restaurant is a fun, local favorite which is a fast paced option for a business lunch and great for large parties and special events.